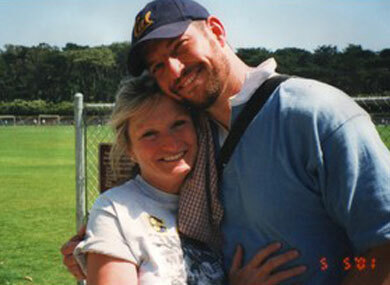 Anyone who knows the story of Mark Bingham couldn’t help thinking of him yesterday when Carson Daly made jokes about gay people not being able to take down the crazed pilot on this week’s JetBlue flight. Bingham is a gay man who among the heroes on United Flight 93 who are thought to have fought their hijackers on Sept. 11, 2001. United Flight 93 went down in Pennsylvania instead of a government building in Washington D.C. as was planned. Bingham’s story was the subject of the documentary With You which was seen around the US film festival circuit last year. Bingham’s mother, Alice Hoagland, shared with TMZ.com today some thoughts about Daly’s comments. Will it ever stop? And what exactly is your heroic contribution to humanity, Mr. Daly? It always appeared to me that Daly was a homophobe. Here’s more proof. Wonder what he would do if he was in that situation? Hello to Joan. I don’t think it will ever stop, sorry to say. thank you Alice for reminding us again of Mark’s heroics on that dreadful day and the utter ignorance of Carson and so many others like him….